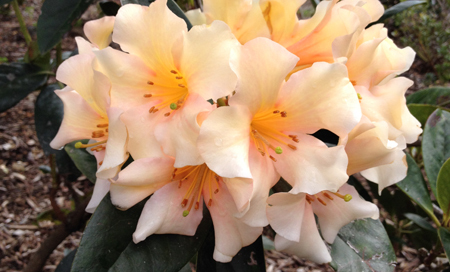 Rhododendron faberi is yet another member of subsection Taliensia growing in Sichuan, China. An easy to grow species with the usual thick woolly, rust-coloured or dark indumentum under the leaves which takes a little time to develop, then is shed to reveal a thin whitish layer of indumentum. Grown in the open it forms a compact rounded shrub to about 1.5 meters in height and densely covered with dark green leaves. The pinkish buds open white with a pink flush which soon disappears as the flower matures, these may or may not have a dark blotch or red spots. R. faberi was discovered by Rev. E Faber around 1887 on the summit of Mt. Omei in western Sichuan and was described in 1889. Other collectors were successful in also finding it in the same area. It has taken us quite a while to source seed of this somewhat rare species but the few plants we have are growing well. However we are propagating more. If you wish to locate these plants look for the name tag partway down the top road on the left hand side. Good hunting.